All your scrap goes right back into the hopper and is recycled, vacuum deaired and pugged. Stainless Steel: Shaft, augers and paddles of stainless steel, along with aluminum mixing and pugging chambers, make for rust-free clay processing. 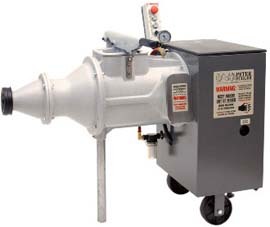 Removable Blades: The mixing blade/auger assembly is removable for ease of cleaning. Large Hopper: The 8" x 8" hopper door allows for easy loading of up to 85 Ibs. of clay per batch. Vacuum Deaired: Each batch can be deaired by starting the vacuum pump when the load is mixed. Air is removed during the last stage of mixing, leaving an air-free product when pugged out. Hopper Door Size: 8" x 8"
*Capacities vary depending on clay conditions, type, moisture, etc. **3-phase, 50Hz and other motors are available on special orders.